1. Planning to buy a new big suitcase since I did not have any big suitcase *excuse*. Fortunately, I saw a cute-flowery-big-suitcase at 'Bags City' with 50% discount plus 10% additional discount for BCA cardholder. What more could I say? Dream came true. The deal was agreed in the very first place. Still, there's also a pity story. On the way to parking lot, people looked at my hubby, who pulled the big suitcase, suspiciously. Perhaps, they wondered, "What's this guy going to do with the suitcase? Hopefully not to put a dead body in there." Well, lately, the trend of murdering someone, mutilating, and finally putting the victim in the suitcase's getting more in numbers. How poor my hubby was. He was the victim of a discount-holic wife. Sorry, my dear Ayah. 2. The luck still continued. Starving on lunch time. Najla as a big fan of Pizza Hut, surely chose the place to have our lunch there. When the bill came, the waiter asked, "Do you have a BCA credit card? There's 15% discount for BCA cardholder." 3. The last luck was on our way home, I dropped by at Haagen Dazs. Buying 2 (two) pints of ice creams and voila.....there's 50% discount for Mandiri cardholder. Well, yesterday was really my lucky day. I loved it very much. This book really made me full of tears. 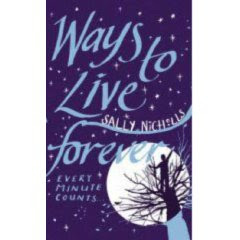 Written by Sally Nicholls. It's a journal of Sam, a-11-year old-boy who is dying of leukaemia. His story is neither tragic nor sentimental. It tells about the lists, the stories, pictures and all questions and facts collected in his dying life. 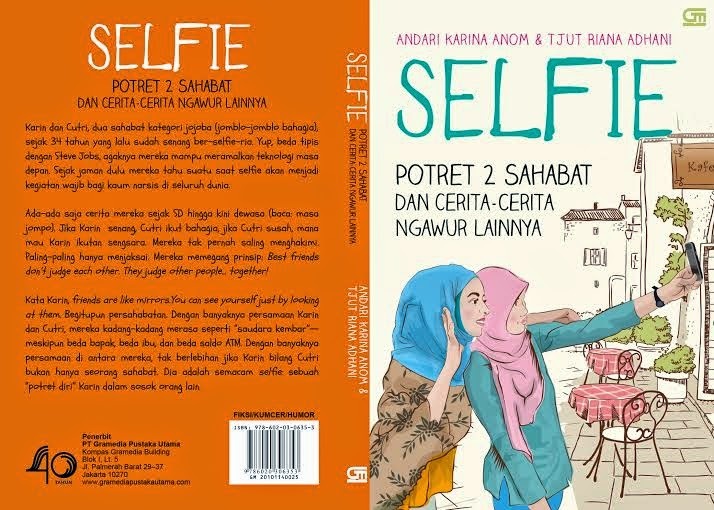 His sincere thoughts about life and death make this book considered as one of the book that could raise your spirit in facing one of the inevitable facts in life. It is written from Sam's perspective. Remind me of the characters of Christopher Boone who appears in "The Curious Incidents of the Dog in the Night-Time" by Mark Haddon and also Bruno in "The Boy in the Stripped Pyjamas" by John Boyne. The stories are very touching. So naive. So pure. Children's world is always beautiful. Even if they tell about tragic things. We as grown-up people, usually feel guilty and sorry for the children who experience tragedy in their childhood. My evening ritual almost similar every night. Started by taking my daughters, Najla and Zea to the toilet, changing their clothes into pyjamas and ended up by telling them the children stories. Last night, after finishing the storytelling session, I saw that both of my little girls looked terribly sleepy already. Then, I asked them to go to sleep right away. me : "Okay girls, it's time to go to bed." Najla & Zea : "Okay." me : "Well, girls, before you fall asleep, do you want me to...uhm...sing a lullaby or something?" Najla : (answer in her sleepy tone) "Ma, just keep quiet." 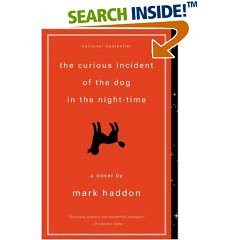 "The Curious Incident of the Dog in the Night-Time" was the first Mark Haddon's book that I'd read. It took quite a long time to finish it since my friend lent me the book of Shopaholic series that seemed more juicy, so I had to put this book for a while. The book itself tells about Christopher Boone, an autistic-fifteen-year-old-boy. The story is told from Christopher's point of view. It's really funny and at the same time sad. From this book, we can learn how an autistic person thinks of everything. Like Christopher, he's really smart. He knows all the countries in the world with their capitals, he knows prime numbers up to 7,057. He has good relationship with animals, while he has no understanding of human emotion. He cannot stand to be touched and he detests yellow color. He lives in patterns, rules and a diagram kept in his pocket, until one day, a neighbor's dog is killed and he decides to solve the murder in the style of his favorite detective, Sherlock Holmes. Time acclaims that this book is 'funny, sad and totally convincing'. Yes, the story is really vivid and memorable. I still keep thinking about Christopher's life even after I finish it. A unique one. I am not a freaking shopping girl *denial*. I just can't stand the statement of 'Mid Year Sale Up To 50%', 'Year End Sale', Buy One Get One Free', 'Additional 10% For Certain Cardholders', etc. I know the quote of 'getting the maximum quality of life with the minimum number of possession', still...in real life is a bit difficult to implement it *excuse*. Take example for clothes, if I purchase new clothes, I have to take other clothes out of the closet. Buying 3 new clothes means that I have to choose other 3 blouses and take them out of my closet. But, in fact, when it's time to select the clothes to be put out of the closet, I suddenly come out with a lot of reasons, 'well, this one has sentimental reason', 'while that one is still good, I'll wear it' (although, actually its size doesn't fit me anymore, but I'm an optimistic person, I'll go on a diet someday in the future. Only God knows). The result is my closet is so full and no empty space in it. Living in Jakarta with its great malls really accommodate my habit. I happened to read this line in one of luxurious mall in Jakarta, "Shopping makes you feel comfortable". It seems that the mall management really understand their customers needs. They spoil them with nice atmosphere and promotion here and there. Moreover, my office is surrounded with big and famous malls which always keep tempting me to spend my lunch break there. The process usually takes like this, I start by having lunch, continued with sightseeing, and end up with certain shopping bags to take to the office. Don't blame the mall management, they just do their jobs. Me, the one who must take responsibility to stop my shopping habit. Well... I'll try. I don't know when but I promise I will *let's see*. Paulo Coelho, a Brazilian author said in his book "Like the Flowing River" : "Some of my friends complain, that because they have so many clothes, they waste hours of their life trying to decide what to wear. Now, that I have reduced my wardrobe to 'basic black', I no longer have this problem". I can't imagine if I have to wear black dress to the office everyday just like Mr. Coelho does, perhaps my boss will ask, " What's happened to you? Are you now a member of Deddy Corbuzier's Fans Club?". Working in Jakarta with its notorious traffic jam could really turn you mad. I have experienced it a lot. As a commuter who lives in the suburb a.k.a pelosok and work in Sudirman area, I could spend 4 hours (even more) in the vehicle to go back and forth from my home to the office. Thank God, before I get more depressed and decide to open my own business (in my dreams), PT KAI introduced 'the great express train' from Sudirman Station (formerly Dukuh Atas) to Bogor, Depok, Bekasi, Serpong & Tangerang. I am the one who really over excited to welcome this 'magic transportation' (exaggerating) and officially join the Rocker (Rombongan Kereta). If it usually takes 2 hours to get home, while this express train only takes 30 minutes, fabulous, isnt' it??? The trains have their regular schedule (OK, sometimes they're late) and usually people always take the same schedule, just like me, my office hour ends at 05.30 p.m. so I could take the 05.38 p.m. train, always like that. Other people mostly do the same, therefore gradually we get close to each other and make a lot of friends at the station, in the train, even in angkot since we always meet everyday, same time, same place. No wonder, if certain people could have a very special relationship and get married with their train partner, amazing. PT KAI keep adding the train schedules (as a train lover, I really appreciate it), so now I could choose the trains, sometimes I take train that stops at Depok Lama Station. Along the station, you will find the food sellers of the not-too-healthy-food-but-God-it's-so-yummy, such as: all kinds of goreng-gorengan (uhm...my favorite) cakwe, burung dara, jajan pasar, kue rangi, kue putu, etc. But, if you take train that stop at Depok Baru Station, different atmosphere will welcome you, you will see a lot of vegetables and fruits seller along the station. Not to mention, the seller of the salted fish (ikan asin) and very cheap kids toys. Therefore, it's very common here to see a very-chic-career-woman-with-high-heels-and-blazer is arguing with the seller to get the 'amicable' price of vegetables. Well, women were born with the ability to bargain, it's just our basic character. Last weekend I accompanied my first daughter, Najla to go to Kampung Maen at Parkir Utara Senayan, I left Najla's younger sister, Nayzea at home, since I thought that she's still too small to join the activities (sorry, my dear). We arrived there at 10 am and the place already full of children and their parents. We gathered in a wide area full of trees and the wind blew slowly, nice place after all. There were around 50 games to join. Najla tried some of them, the queue was very long. Especially for Kampung Rasa where children got the opportunity to cook. So...here they were, acting like a real chef, wearing apron and ready to cook. The food were varied, e.g: noodle, meatballs, milkshake, chocolate, pancakes, kue putu, etc. There's also Kampung Tradisional where we could make batik, rattan basket, kites, etc. Sporty games were also available like flying fox and other out bond games. So many things to do there but I couldn't stand the queue, taking so long. Beside that, since Najla is still 3 years old, she didn't match to play some games. It seemed that the activities mostly for 5-year-old-children and up. We left the place around 12 o'clock. It's very hot and crowded. All people headed to Senayan, no wonder, there were Bobo Fair, Books Fair, Plants Exhibition, Kampung Maen, etc, so many events on the same day. On our way home, we dropped by at Plaza Semanggi. I planned to buy groceries at Giant Supermarket. before that, we decided to have our lunch at Chicken Rice Shop (nice place & good food). Najla looked sleepy and tired, but when we arrived there, she suddenly felt fresh, how come? Well...it's not because of the food, in fact Najla is a picky eater (don't compare with her mom who is a food lover), but she's curious with the Duck-Man, there's a man wearing a duck yellow costume. According to Najla, the Duck-Man's cute. After checking the Duck-Man thoroughly, Najla agreed to leave the resto. We walked along the mall and suddenly I saw this cute-black-shoes with 20% discount for BCA cardholders, after having a quick thought, I decided to buy it (finally).